Under the Control of Canadians! Unifor 222 press conference, November 26, 2018, demands GM keep Oshawa plant producing. GM executives in Detroit have announced the closure of an auto assembly plant they control in Oshawa, Ontario. The shutdown will terminate the direct employment of 2,522 auto workers, members of Unifor Local 222 and a large number of salaried workers, and result in an enormous loss of value for the Canadian economy and community. The closely kept secret of the GM foreign oligarchs caught most Canadians off guard and has sparked outrage and debate on how to respond. Two main responses have emerged. The first is one of complete impotence. Prime Minister Trudeau and Ontario Premier Ford appear to have accepted the GM decision as final and have focussed their remarks on how to help the affected workers deal with the crisis of unemployment and loss of income. In his press conference addressing the issue, Premier Ford repeated his neo-liberal mantra of making Ontario "open for business" for the very same oligarchs who are wrecking the economy and attacking Canadian working people. The other response is outrage and a desire to do something to resist the decision of the U.S. oligarchs. Unifor Local 222 and most of the workers interviewed in the mass media condemned the closure as an attack on Canada, the economy and working class. They expressed a determination to stop the shutdown and the loss of jobs and manufacturing value. Upon hearing the official news on Monday, November 26, the morning shift at the auto plant was gripped with shock, grief and anger. Workers gathered outside of the plant and in the Oshawa union hall to discuss what to do in the face of the situation. Some workers said the government should force GM to pay back the billions of dollars in subsidies and other pay-the-rich schemes the company has received over the years, especially after the 2008 economic crisis. 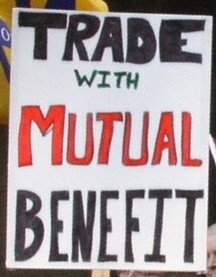 Others bitterly said the closure is the thanks workers receive after all the concessions in their collective agreements they have given GM in the last twenty years, resulting even in a three-tier workforce. A veteran worker said his son, who started recently at the Oshawa plant, receives only $2.11 more per hour than he did when he started in 1985. Can you imagine how much less that is with price inflation, yet the company is still not satisfied. Let that be a warning to other Canadian workers against giving concessions, he said. How to reverse the decision of the global oligarchs and chart another direction for the economy is a serious concern for all Canadians. The decision of the oligarchs to wreck the economy on this scale causes untold damage throughout the local economy and well beyond. Much of the material and parts for the vehicles to be assembled originate in other plants, steel mills and mines in Ontario. Needless to say, the oligarchs in control do not even live in Canada let alone in the communities their decisions directly affect. Manufacturing for a long time was the backbone of the southern Ontario economy but has been under attack from the global oligarchs since the turn of the century. During the last ten years alone, manufacturing as a percentage of the total Ontario Gross Domestic Product has fallen from 16 per cent to just 11.7 per cent. Sudden attacks such as the GM Oshawa announcement focus attention in the immediate sense. In a way they test the mettle of the working class, its current condition and the ability of its institutions and social consciousness to defend itself and Canada from the global financial oligarchy and defeat these attacks on the economy and country and chart a new pro-social direction. The ability of the working class to respond forcefully and defend itself depends greatly on whether it has organized itself independently of the ruling oligarchs, their institutions and agents within the political and social organizations of Canada. For the working class to fall prey to the cartel political parties of the financial oligarchy and not have its own independent politics and institutions leaves itself vulnerable to these attacks and incapable of mounting a serious resistance. 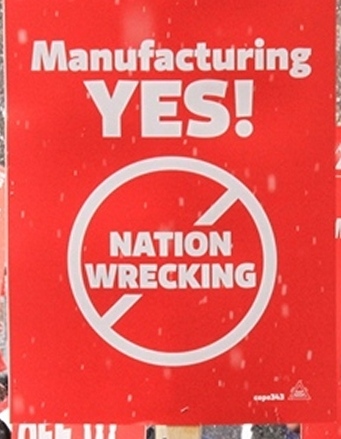 The destruction of manufacturing in Ontario and the entire neo-liberal anti-social offensive have occurred under the watch and governments of the three main cartel parties in Parliament and the Legislature. They have either been willing participants in these attacks or have done nothing concrete to stop them. The renegotiation of the North American Free Trade Agreement (NAFTA) into the U.S.-Mexico-Canada Agreement (USMCA) is an example. Just last month, the Trudeau Liberal government's Foreign Affairs Minister Chrystia Freeland boasted of the "well-balanced outcome" of Canada's trade negotiations with Washington. Freeland said the Trudeau Liberal government had saved Ontario vehicle manufacturing from the attacks of Trump. She wrote vaingloriously, "The car industry now has stability and room to grow and thrive." This was said despite the fact that not one vehicle manufacturer is a national institution, none of the decisions of their leading oligarchs are made to strengthen nation-building but only to serve their narrow private interests, and that the USMCA leaves in place the U.S. steel and aluminum tariffs against Canada in the name of U.S. national security. The Oshawa shutdown does not demonstrate stability, growth or some Liberal fantasy of what it means to be thriving. The working class movement at one time had a clear head that free trade would be a disaster for Canada's sovereignty and working people and opposed it. Despite widespread opposition, the Conservatives and Liberals forced free trade through Parliament, which became a victory for the U.S. oligarchs and their determination to eliminate any impediments to their control. NAFTA and the line of making Canada "open for business" for the global oligarchs has destroyed the last remnant of sovereignty and has left Canadians vulnerable to the wrecking of the global financial oligarchy. What control do Canadians now have over their own economy and lives? The foreign decision to shutter the GM Oshawa plant is but one disaster that was made behind our backs and without our say. The dismantling of Bombardier's commercial airline business was a direct attack from Boeing and the U.S. Pentagon. This lack of control has to change if working people are to be able to defend themselves and their well-being and turn the situation around. A new direction for the economy can only be achieved with control of the working people over their own organizations and over all the decisions that affect their lives. Workers in Oshawa have been manufacturing vehicles for one hundred years. At one point, workers at the Oshawa plant alone built one million vehicles in a single year. Why was the value from that production not reinvested back into manufacturing in Ontario and in developing a stable national market for vehicles produced in Canada, let alone creating a more diversified and vibrant economy not vulnerable to crises, which can engage in trade with others for mutual benefit and development? The answer is simple: Canadians do not control their own economy and without that control they cannot control their lives or build their nation to secure their well-being. Those in control are not nation-builders; they are empire-builders out to satisfy the insatiable demand of the owner-oligarchs to expropriate more and more profits from the value workers produce. The pundits and politicians for the financial oligarchy say Canada is too small to have its own market and must rely on the global imperialist market to survive. This disinformation is meant to discourage investigation and discussion and declare nothing can be done to change the current reality that Canadians do not control their economy and cannot even engage in trade with others on a modern basis of mutual benefit and development. The pundits simply rationalize the fact that the global oligarchs control everything to serve their own narrow private interests and could care less about Canadians. Canadians bought around two million vehicles last year and produced about the same number. Is that not a solid home market, which trade could further enhance? The value from that national market could be the foundation for moving vehicle production into a new era of social responsibility and humanization of the natural and social environment. But that national market and international trade have to be under the control of Canadians and not the global imperialist oligarchs. The time is now for the working people to organize themselves in a new way to meet the challenge and assault of the global oligarchs. The time is now for a new direction for the economy. Control of the economy and politics of the country must be in the hands of the working people to serve their well-being and nation-building. The global oligarchs are attacking Canadian lives, well-being and social fabric. The shutdown of the GM plant cannot go unchallenged! Unite in defence of the Oshawa GM workers and a new direction! 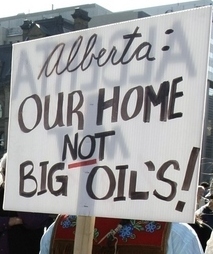 The Alberta government seems to have decided or rather one could say is caught in the imperialist outlook that its future must rise or fall based on whether Alberta oil can reach world markets at a hoped-for higher price. All other considerations have disappeared. Premier Notley is using her voice and bending all efforts to force this view not only on Albertans but all Canadians. She and her government view their role as servants of the way things are under the control of the energy oligarchs and do not view any alternative as possible. The cartel parties lack the modern outlook and courage necessary to confront the global oligopolies that control the oil sector and Alberta's economy. Adopting the outlook of the financial oligarchy and serving its narrow interests also means falling into line with this or that powerful section and being an instrument to do its bidding. 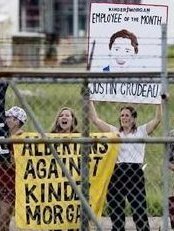 Whether the Notley government survives or falls in next year's election may very well depend on the price of crude oil, especially the price differential affecting Western Canada Select, and whether the Trudeau government succeeds in forcing through the Trans Mountain pipeline. For the working class to succumb to such paralysis in thinking and action is suicidal. The issues and agenda presented by the contending cartel parties in the coming 2019 Alberta election, and the 2019 federal election for that matter, in the final analysis serve one section or another of the financial oligarchy. They are designed to make sure no alternative is presented or debated. These cartel parties do not want the working class to develop its own independent politics, which means no alternative to the contending views of the financial oligarchy are to be discussed. The most pressing issues facing Albertans and Canadians are this absence of the independent politics of the working class and their lack of control over the issues that affect their lives. Only with a modern outlook and alternative solutions that are independent of the demands of the contending oligarchs in control of the economy, and the political power and control to deprive the oligarchs of their power, will Albertans and other Canadians be able to overcome the problems of the economic crisis they face and stride out of it with confidence in a new direction that favours the people. of Being "Open for Business"
The Alberta energy monopolies and provincial government are quite unanimous that a problem facing the industry is a lack of pipeline/transportation capacity to move the oil to world markets. As is well known, the Alberta government has for some time called for the expansion of the now federally-owned Trans Mountain Pipeline from Alberta to the lower mainland of BC. As well, the Alberta government has asked the federal government to help increase crude-by-rail capacity as a short-term solution. On August 30, Canada's Federal Court of Appeal halted the Trans Mountain expansion for what the court assessed was a lack of adequate consultations with Indigenous peoples. Also complicating energy and revenue matters for the Alberta government is the Alberta Energy Regulator's recent announcement that it will cost the public treasury of Alberta over $58 billion to clean up the decades of environmental mess left behind by the mostly foreign-owned energy monopolies, which took their money and ran. The necessary amount for environmental remediation of abandoned wells and other contamination is reported in some circles to be closer to $260 billion. Public opinion is strongly in favour of the energy monopolies cleaning up their own messes. However, forcing them to do so runs up against the neo-liberal mantra of the provinces and Canada being "open for business," using public finances to pay-the-rich, and letting the monopolies do whatever they want. 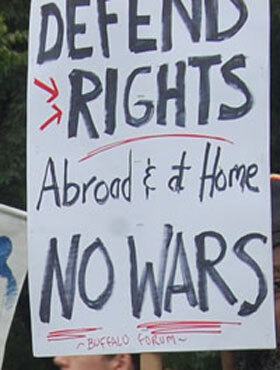 No cartel party government in Canada has had the courage to challenge this imperialist mantra. Conciliation on issues of pollution is similar to that of caving in on the issues of oil prices and the crucial long-term necessity of reinvesting the value from energy production back into the Alberta economy to diversify it and defend the people against economic crises. The contradictions among the energy monopolies are yet another problem stemming from their control of the economy. The relatively low level of gross income and royalty payments to the government from recent energy production emanating from low market prices for oil is used to argue for reduced investments in social programs and public services, including infrastructure. This assertion is not based in science and arises from an imperialist distortion that social programs and investments in education and health care and infrastructure do not produce new value. The energy and other monopolies conveniently trot out this disinformation whenever they are asked to pay for the value they consume in their operations from social programs and infrastructure, which is transferred into the value their workers produce. The oligarchs who own and control parts of the socialized economy deny its interconnectedness and the necessity for conscious planning to enable all sectors to work together for the good and stability of all. A modern economy needs to have a foundation of strength in all basic sectors of resource extraction, manufacturing, social programs and public services including infrastructure with the value workers produce in each sector being realized in all the others. This is presently not the case within the imperialist economy where oligarchs view their particular part or sector in competition with other parts and sectors in an anti-conscious quest for maximum profit at the expense of others and the whole. For example, the moguls of the energy monopolies refuse to realize (buy) socially produced value in the education and health care sectors in a proper and aboveboard exchange with the public enterprises that produce the value. The monopolies mostly consume for free the new value workers produce from investments in social programs and infrastructure or at least consume value without properly accounting for the amount they consume and paying for it in exchange with the institutions producing the value. They even exceed this refusal with a constant demand or blackmail not to pay taxes and instead to be paid public funds or they will not operate as some other jurisdiction may offer them a better pay-the-rich deal. The recent Amazon "contest" to find the jurisdiction that offered the monopoly the best pay-the-rich deal to open a second headquarters was a particularly disgusting case in point. 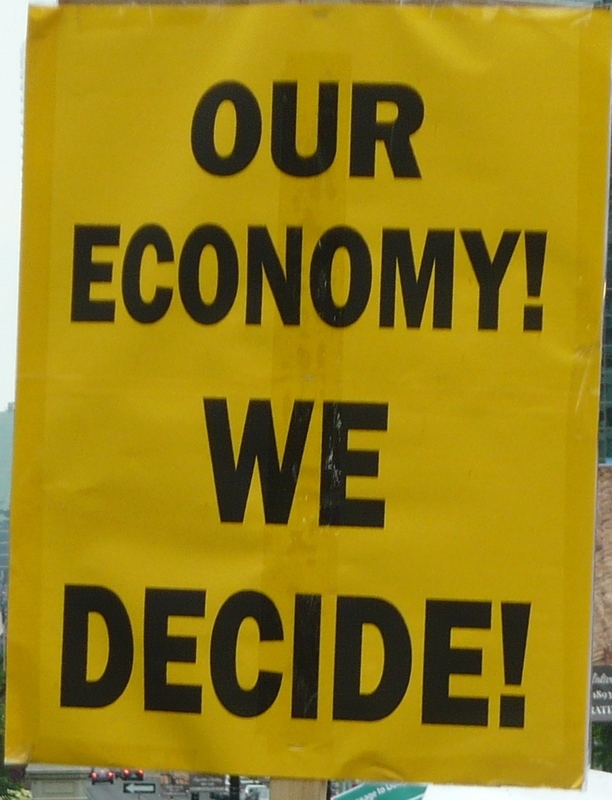 With the economy under the control of the rich oligarchs, greater production and profits or high Gross Domestic Product (GDP) from raw material exploitation and production does not automatically translate into greater investments in social programs or in manufacturing for that matter, which has long been a problem and bone of contention in Alberta. After all these years of workers producing enormous social wealth in the energy sector, Alberta's economy is still not diversified and stable. The energy oligarchs in control have taken social wealth out of the province and left its other sectors weak and vulnerable. A comparison of GDP figures from Alberta and Newfoundland and Labrador (the two provinces with the greatest percentage of GDP in resource extraction) with GDP figures from Ontario and Quebec reveal no automatic connection between a high percentage of GDP from resource extraction and greater investment in social programs. In fact the opposite appears to be the case. 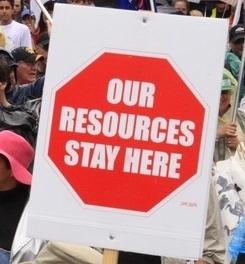 A particular problem arises when gross income from natural resource sales leaves the province, does not realize in full the social product it consumes from other sectors and does not reinvest social wealth back into the provincial economy to build an all-round sustainable economy with manufacturing, social programs, public services and resource extraction as a diversified and increasingly self-reliant foundation. This leaves Alberta, and other resource extraction dependent economies, vulnerable to serious problems when the resource sector stumbles. 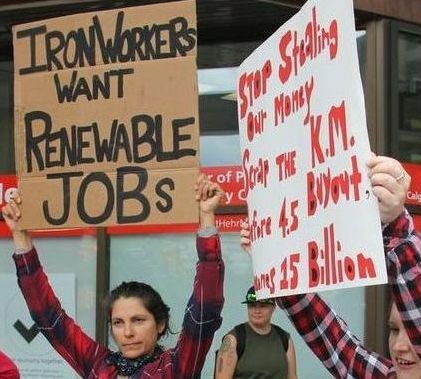 The prolonged downturn in Alberta's energy economy, in addition to causing hardship for working people, is sharpening the contradictions among the energy monopolies that rule the province. A current driving force of contention is the large oil price differential between West Texas Intermediate (WTI) and Alberta's Western Canadian Select (WCS). WTI currently sells at about $52 per barrel (bbl) and is used as a benchmark in crude oil pricing on the New York mercantile exchange. WCS is a heavy crude oil that sells at around $20 per bbl. These prices fluctuate but the large gap remains. The price differential means lower income for certain energy monopolies and the Alberta government. The government and some energy monopolies want to narrow the gap in prices and have proposed a governmental order to cut provincial oil production to raise the price of WCS. The suggestion to reduce output has been met with both support and opposition from the major energy monopolies due mainly to how they expropriate their profits. Cenovus and CNRL, which profit from selling WCS crude, are in favour of an Alberta government order to cut output in an effort to raise the oil price. Suncor, Imperial, and Husky, in opposition, do not want government intervention because they profit from the low price of WCS, which has become feedstock for their downstream refining operations in the United States. Tim McKay, president of CNRL, charged on November 2 that "unnamed energy industry members" are deliberately interfering with attempts to make pipelines run more efficiently because they are making "windfall revenues" from current low prices for Western Canadian oil. Apparently inefficient pipelines are creating a glut of unsold WCS in Alberta. McKay did not clarify why a glut of oil in Alberta, which cannot reach customers, would cause an oversupply and subsequent low price at the receiving end of "inefficient" pipelines. In contrast on the same day, Imperial CEO Rich Kruger stated, "In the current challenging upstream environment, we are uniquely positioned to benefit from widening light crude differentials." In his case, Imperial is gloating that it buys WCS at low prices, some even from itself, for refining in the United States where the refined oil is sold at substantially higher world prices, a self-serving situation indeed. The contending positions highlight the outlook of the oligarchs, which views problems in the socialized economy from a distorted narrow lens of what serves their particular private interests. No economic problem can be solved with this outmoded outlook. Problems in the modern interrelated economy of industrial mass production require a modern pro-social outlook that views problems as they pose themselves objectively for the greater good of the whole without twisting them to suit pre-conceived notions based on narrow private interests and imperialist dogma. The problem with market prices for crude oil arises from the control and manipulation of the sector by the financial oligarchy. Prices are not determined scientifically according to a modern formula that serves the economy and its extended reproduction, and leads to trade for mutual benefit and development, rather than the current constant crises and often violent big power contention for global dominance. The overall market price for crude oil, not just WCS, has once again plunged. The dramatic recent fall of market prices below their prices of production cause difficulties, especially for workers in the sector and throughout Alberta who are always forced to bear the brunt of the recurring crises. They also pose difficulties for countries such as Venezuela that greatly depend on oil production and sales, and have become a target of U.S. imperialist interference and threats of invasion and regime change. Regarding the price differential between WTI and WCS, the energy oligarchs in control and their representatives in government do not present a scientific rendering of the problem. They do not clearly reveal a price of production of either WTI or WCS from which a suitable stable market price could be found and demanded. Part of this stems from the dogma of "letting market forces decide prices" and part stems from the fact that the financial oligarchy uses its monopoly control to manipulate prices for its own narrow benefit and to attack its competitors and enemies. Imperial CEO Kruger's admission that his monopoly is "uniquely positioned to benefit from widening light crude differentials" shows the true nature of these oligarchs. Kruger does not want to have a scientific rendering of prices, let alone government intervention to stabilize prices, because at this time his monopoly is benefiting downstream from the low price for WCS. McKay, president of CNRL, and other oligarchs want action to reduce the supply of WCS with the expectation that would raise the market price. Such a move favours their particular monopolies, if successful in raising the price of WCS. But this again views the problem from a narrow perspective of self-interest for particular energy monopolies and does not solve the problem of fluctuating oil prices generally such as the current generalized collapse. In fact, McKay and the government contradict themselves by saying reducing supply is a solution yet at the same time denounce "unnamed energy industry members" whom they accuse of deliberately interfering with attempts to make pipelines more efficient. More efficient pipelines presumably would increase the supply of WCS for buyers and according to imperialist dogma would reduce the price even further. Neither McKay nor the government explains why flooding the world with Alberta oil using newly built and more efficient pipelines would result in higher prices for heavy oil. The problems of supply, delivery and price of western Canadian oil stems from the control of the industry by the global energy oligarchs and their outlook and contention for dominance. The global energy oligopolies control all aspects of the Canadian oil sector and manipulate it to serve their private interests. This means the problems of the sector are not viewed as how they pose themselves but rather how they serve the particular private interests of those in control. If problems were resolved in a manner that serves the Alberta working people, general interests of society and the extended reproduction of a diverse Alberta economy, the recurring economic crises could be avoided. The issue is who decides: the oligarchs in favour of their narrow private interests or the people in favour of the broad interests of all, the overall economy and society. When governments or working people line up behind the private interests of this or that grouping of oligarchs, this signals that they are caught up in the same backward outlook as the imperialists and are incapable of viewing problems as they pose themselves and finding solutions that favour the people. An outlook lacking in objectivity of consideration and unable to engage in concrete analysis of concrete conditions blocks any government and the working people from finding the root of the problems and determining solutions and charting a new direction out of the current difficulties. A new direction for the economy requires a new pro-social outlook and the control of the working people over all economic, political and social affairs that affect their lives. The following monopolies appear to have profited from the lower price for Alberta's Western Canadian Select (WCS) of $20 per bbl compared with around $52 per bbl for West Texas Intermediate (WTI). Downstream refiner Suncor expropriated $1.6 billion in company profit in the third quarter of 2018 (three-month period), up from $867 million in the same period last year. Imperial expropriated $749 million in the same quarter, up from last year's $371 million, while Husky expropriated $545 million in the same quarter, up sharply from $136 million in the same quarter last year. The oligarchs in control of these monopolies oppose any government initiative to reduce the supply of WCS in an attempt to raise the market price. Other monopolies want a reduction in supply as they have been harmed by the low price of WCS. Cenovus reported a $241 million loss for the same 2018 third quarter. CNRL exceeded expectations with a profit of $1.8 billion; however, CNRL is much more diversified than Cenovus. A significant proportion of CNRL's third quarter profits was due to sales at the world oil price from its international operations, including drilling in the North Sea and offshore Africa. According to the CNRL website, the latter "provide some of the highest return on capital projects in the Company's portfolio." Non-Status Persons of Haitian Origin! Every day dozens of people are being deported to Haiti. Non-status persons of Haitian origin awaiting deportation are experiencing insufferable harassment on the part of the Canadian government. One day the government is deporting them, the next day it is not. One day their application for asylum is refused, their deportation date is set, and the next it is annulled and they are told that they will be called back in a couple of weeks. This is an inhumane and untenable situation. The government announced a stay on the deportations planned for the week of November 19-25, then on November 26 it resumed the deportations. On November 27, the Canadian government announced a new stay on the deportations without specifying the time-frame. TML Weekly is posting below an interview with Frantz André who is a member of Action Committee on Non-Status Persons and accompanies those caught in this terrible plight. The interview was originally published in a special edition of Chantier politique, the online publication of the Marxist-Leninist Party of Quebec. Frantz André speaks at a rally against deportation of Haitians seeking asylum, July 21, 2018. Chantier politique: Hello Frantz. You are calling for a moratorium on the deportations. Can you elaborate? Frantz André: What has to be understood is that a crisis has been caused over the $3.8 billion that disappeared from PetroCaribe. PetroCaribe is an oil alliance with Venezuela for the purchase of oil on preferential terms. The funds saved were supposed to go towards development programs for the population. The $3.8 billion was to be a starting point. The person who started to question this is Gilbert Mirambeau, a filmmaker of Haitian origin in Montreal. He questioned this and, fed up with what was going on in Haiti, he wrote on a piece of cardboard "Kote kob petrocaribe a?" (Where did the PetroCaribe money go?) and circulated it on Facebook. That snowballed. All the youth in Haiti who are denouncing the government began to do the same. To get back to the $3.8 billion that disappeared, accountability was demanded. A senate committee was set up, the Senate Committee on the Management of PetroCaribe Funds, which submitted its report in November 2017. A few people were singled out, although not necessarily those who were responsible. And there was never really any follow-up after that. The movement demanded justice and accountability. But the report has not gone any further. We even know that certain senators benefited and profited from that money, so they have no interest in taking this any further. The current mass demonstrations taking place have given rise to riots. Following on the heels of PetroCaribe, the government aggressively increased the price of fuel by 50 per cent at the beginning of July. And of course the population reacted. Riots took place on July 6, 7 and 8. There were some deaths and material damage. And the government resigned at that time. There was another attempt at a new government. What is noteworthy is that on July 6, 7 and 8, the Canadian government closed its embassy and requested that Canadians not travel to Haiti unless it was essential and asked that those already in Haiti return home. So, with regard to asylum seekers being deported, we said: if this is not good for Canadians, why would it be good for people who left for reasons of insecurity? It was at that point that I requested a moratorium. After that, we held demonstrations outside the offices of Immigration Canada, on July 14, 21 and 30, and then PetroCaribe. Now, how does all this affect asylum seekers here, who benefited last week from a seven-day reprieve? With demonstrations taking place daily in Haiti, over 30 people have been massacred by machete -- people have been killed in demonstrations -- a car drove into protestors killing nine people, so the population is paying the price. Based on credible sources, gangs are fighting each other and are being armed by the government and the opposition, amongst others. So there's an attempt to stifle the issue of accountability on PetroCaribe by crying "instability." In my view, it is a mini civil war. And the fact that between November 18 and 25 the government stopped deportations again, within a four-month period, is an admission that Haiti is not a safe country. So why this constant stop-start scenario rather than putting in place something more permanent, such as telling people, for example, that a year will be taken to see whether or not the government is credible and takes up the issue of PetroCaribe. We, as Canadians, have a moral duty not to send people back like that, particularly not in this start-stop mode. This creates anxiety amongst people, the uncertainty that they could be deported at any time. There's a young woman, a single mother, whose son was born in Canada, who was to be deported last week. She was called on November 20 and told she would not be leaving on November 21. However, she had already given up her apartment, given away all her furniture as she didn't have time to sell it, and now all of her belongings are in her suitcases. She is staying with someone while waiting to be convoked, as she was told that she would be called back in three to four weeks to determine a deportation date. It's as if people have been sentenced to death and are in their cells waiting to be executed. It's the equivalent of the U.S. death penalty. A camp hosting refugees who entered Canada from the United States in Lacolle, Quebec on August 17, 2017. Most of the refugees are Haitians who fled, fearing the U.S. will force them to return to Haiti. CP: What's the situation here in Montreal? FA: It must be noted that many hearings have not taken place. With the massive influx of refugees last year, the system was overwhelmed, both in terms of the border as well as receiving centres. As far as legal aid goes, there's perpetual catch up and until now, a lot of improvisation has been going on. Amongst other things, people are caught without being able to access the legal services to check with lawyers if the files of asylum seekers are well prepared. Lawyers today are disarmed, they're giving up. Abritrary criteria are being left to the discretion of those who, in our opinion, have received refusal and acceptance quotas. Quotas were more or less announced last year when Emmanuel Dubourg was sent to the U.S. on two occasions to discourage the Haitian community. He agreed to go. The first time he was sent, just like Mr. Trudeau and Marc Garneau, who were first to speak, he said that between 40 to 50 per cent of Haitian asylum seekers were being accepted. Dubourg returned a second time, and brought the message that only 10 per cent were being accepted. This was done to deter not only Haitians but also Salvadorans and other communities. The 10 per cent was based on an analysis of 297 cases, of which only 29 had been accepted. But the 270 others have the right of recourse federally, on humanitarian grounds, etc. And 297 cases out of around 6,000 is not representative. Between 2012 and 2016, the acceptance rate was between 40 and 50 per cent. Last year, it fell to 22 per cent. Two weeks ago, the rate was 17 per cent. And now, I believe, it is close to 10 per cent. I began accompanying people to 1010 Saint-Antoine Street West [Immigration, Refugees and Citizenship Canada Quebec Office -- Chantier politique Ed. Note] in June, only to find that people are being received in such an extremely disgraceful, disrespectful and aggressive manner to determine whether or not the person might resist, and if they should be immediately detained. They are then sent to the Laval Detention Centre. There are about 150 people there. And now they have decided to build another detention centre right beside the present one, because that one is supposedly obsolete. However, I think that it's to increase detention capacity, because the Canadian government has announced that between now and March 2019, it will increase the number of deportations to 10,000. In a pre-election year, it must appear to be in control. Therefore it is using a particularly precarious community, Haitians, and deporting them. We are invoking the situation of civil war to demand a moratorium. They are also being deported at the taxpayer's expense. If people have no money to buy their ticket, the government supplies it but then people are told that if they come back, they must reimburse the ticket. I found tickets last week for $280. The government is asking $1,500. Besides this they must pay over $550 in application fees to come back. So it costs $2,050 for the right to return, on top of other fees. CP: What would you like to say to conclude? FA: I invite people to come out and demonstrate this Sunday, December 2 at 2:00 pm, outside the riding office of Prime Minister Justin Trudeau, at 1100 Cremazie Boulevard East to demand an immediate moratorium on deportations. Press conference in Toronto, November 18, 2018. 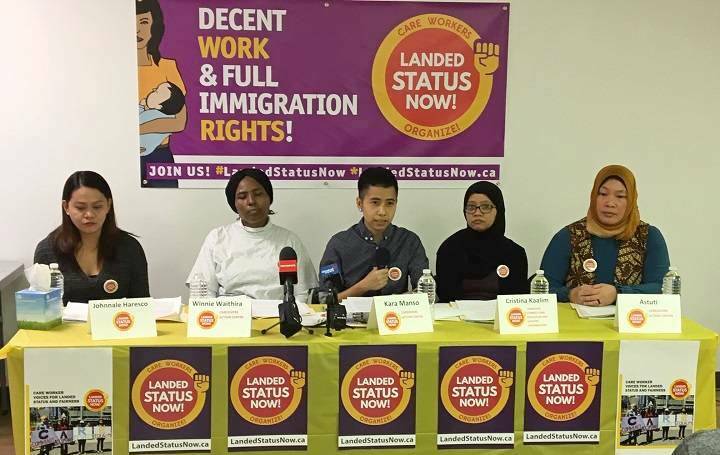 Migrant care workers held meetings and press briefings in Toronto, Edmonton, Vancouver, Ottawa and Montreal on November 18 to release a report demanding that the government uphold their human rights. 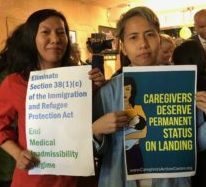 The report, "Care Worker Voices for Landed Status and Fairness," was prepared by 14 organizations representing migrant care workers and serves as the backbone of the campaign "Landed Status Now: Care Workers Organize!" The care workers are making their voices heard both through meetings as well as in the report. They express their pride in doing work that is necessary for society and for the economy to function. They speak and write about their work: caring for children so that parents can go to work; supporting the elderly so that they can live out their lives in their homes; and caring for people with disabilities to support their independence. At the same time, they expose the precarious conditions of their work, for which they blame Canada's immigration system and labour laws. They are subjected to a "two-step" immigration process that requires that they enter Canada with temporary status and an employment contract and without their families. They must complete their employment contract before they are allowed to apply for permanent residence. This temporary status has profoundly damaging and lasting impacts on the physical and mental health of caregivers and their families. 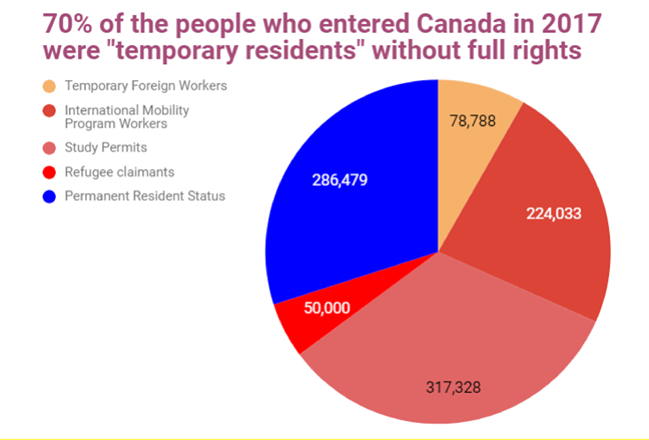 Besides the devastating human impact, deeming these workers "temporary" does not make sense because care giving by foreign workers -- including domestic work, child rearing and senior care -- has been a feature of Canadian society for decades. Forcing workers to accept "temporary" status serves to facilitate and maintain super-exploitation and marginalization of these workers. The meetings and the release of the report are being held as the federal government reviews the current Caregiver Program, which was established in 2014 and is set to expire in November 2019. The care workers are making it clear that they do not want this program extended as is or replaced by another pilot project that retains the same arbitrariness. They are demanding a new Federal Workers' Program for Care Workers that offers landed status upon arrival, for both migrant care workers and their families. - care workers should be able to apply for Permanent Residence after one year of work (or 1,950 hours). Currently, they have to work for two years. One year is the standard for most other permanent immigration programs in Canada. - all care workers must receive open work permits and labour mobility. Care workers currently can work only for the employer listed on their permit, which makes it extremely difficult to leave an abusive employer or, in the case of elder care, to change employers when the person they are caring for dies. - the new education requirements should be removed. Care workers are required to complete one year of Canadian post-secondary equivalent education to apply for permanent residence. Aside from being required to pay foreign student fees, which can run to $20,000 per year, they cannot and are not allowed to study while working. - the requirement to take an English language test prior to applying for permanent residence should be removed. New English language requirements were introduced in the 2014 pilot program, but free English classes are not available to workers with temporary status. - the new caps that allow only 2,750 permanent residency applications each year in each caregiving stream -- caring for children and caring for people with high medical needs classes -- should be removed. For example, over 5,500 care workers come to Canada in the childcare stream each year. The discretionary caps on permanent residence applications mean that at least half of these childcare workers will not be able to apply even after completing all the requirements. - the permanent residency backlog should be resolved. Thousands of care workers have been waiting for up to 10 years to reunite with their families because no one is following up on the applications for family members. - spouses and children of care workers should be allowed to join them with open work and study permits of their own. Family unity is the norm for many other temporary immigration programs and it results in improved health and stronger families than years of forced separation. Care workers and their organizations are planning to organize more actions in the near future to ask all Canadians to support their just demands. "We are asking everybody to support us, meet their MPs, talk about care workers, sign the petition," Kara Manso, coordinator of the Caregivers Action Centre in Toronto, told TML Weekly. Federal elections are coming up. This is the time for Canadians to speak out in defence of care workers. We are not asking for special treatment. We are asking for basic human rights, the rights that others have." 1. The report can be found here. 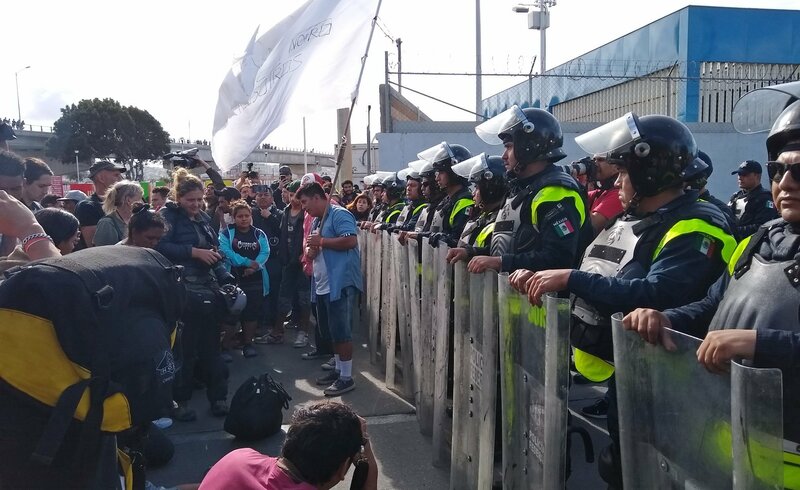 Central American migrant caravan at U.S. border in Tijuana, Mexico, November 22, 2018. On November 9, President Trump issued a proclamation attacking the right of refugees to seek asylum in the U.S. He said that only those who enter the country at ports of entry will be allowed to apply for asylum. He did so at a time when many are already being arbitrarily and illegally turned away at the ports of entry along the southern border with Mexico. Refugees have the right to seek asylum and to do so irrespective of where they enter the country. This is codified both in U.S. and international law, which the president is duty-bound to uphold. Trump is instead openly acting against the rights and laws, which makes the proclamation a criminal attack. It has been backed up by deployment of 5,200 armed military troops to the southern border region. 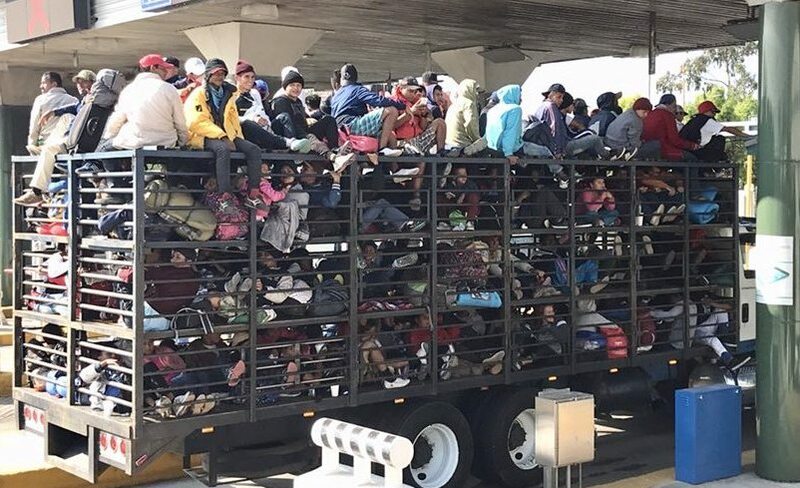 Trump claimed, "This is an invasion of our Country and our Military is waiting for you!" He is using language like "invasion" that lays the groundwork for potentially declaring martial law, and having troops in place to enforce it. Trump is attempting to justify both the proclamation and military deployment in the name of the national interest. The proclamation states: "The continuing and threatened mass migration of aliens with no basis for admission into the United States through our southern border has precipitated a crisis and undermines the integrity of our borders. I therefore must take immediate action to protect the national interest..."
The action taken is to deny refugees who do not enter at ports of entry the right to apply for asylum: "Under this suspension, aliens entering through the southern border, even those without proper documentation, may, consistent with this proclamation, avail themselves of our asylum system, provided that they properly present themselves for inspection at a port of entry... But aliens who enter the United States unlawfully through the southern border in contravention of this proclamation will be ineligible to be granted asylum." Ports of entry have now been further militarized with barbed wire fencing topped with razor wire and detention camps comprised of tents under military control. The suspension is supposed to last 90 days but can be extended by Trump, as can the troop deployment. In the proclamation Trump again emphasized, "The entry of large numbers of aliens into the United States unlawfully between ports of entry on the southern border is contrary to the national interest, and our law has long recognized that aliens who seek to lawfully enter the United States must do so at ports of entry." Actual facts are that most of the refugees do have "basis for admission," such as a "credible fear" of persecution, torture or death if they return to their home countries. It is also the case that both U.S. and international law specifically require the U.S. to accept refugees and hear their cases regardless of where they enter the country. Trump himself also admits that "The vast majority of such aliens are found to satisfy the credible-fear threshold," meaning their claims are legitimate. 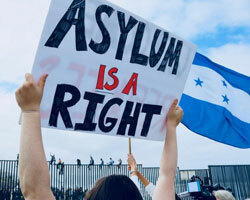 Even so, many are being denied asylum both because most do not have legal counsel (the majority of people that do secure lawyers receive asylum) and many are tricked and forced to sign documents that are used against them, and because the U.S. keeps arbitrarily raising the bar. This includes eliminating domestic violence as a credible fear. The U.S. continues to act with impunity and no doubt will continue to do so regardless of court rulings. 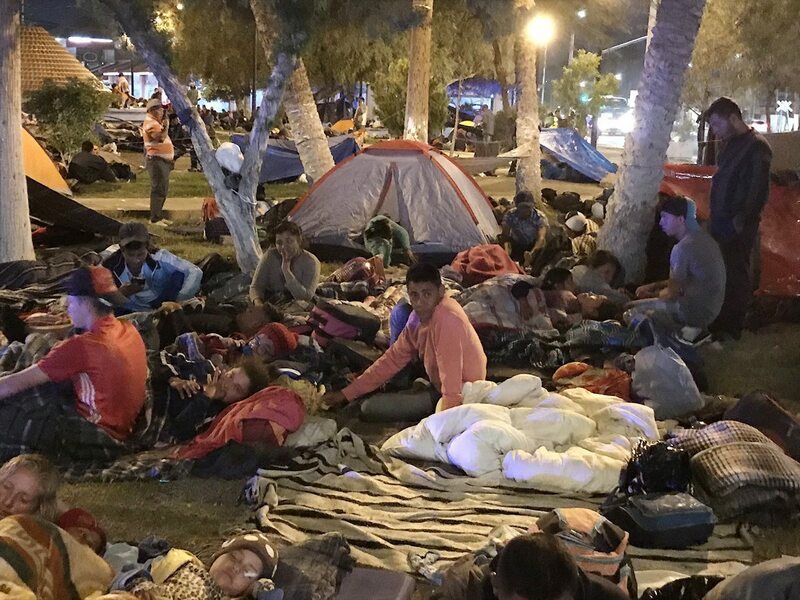 Migrants in caravan travelling through Mexico towards U.S. border. The actions taken by the ruling class in the United States, including their media, to proclaim an invasion, station the military at the southern border and prepare to strip people of their citizenship are not only a criminal denial of rights but are also aimed at blocking and disrupting the heroic resistance movement of the people of the United States. Talk of invasion and threats to U.S. security and way of life are all aimed at depriving people of an outlook which provides them with a favourable vantage point on the basis of which they can identify and sort out the problems they face. A concerted effort is being made to keep people disinformed at a time the vantage point they need is based on the necessity for change, the necessity to empower the people so that they can set a new direction for the economy and bring a democracy into being that is consistent with the demands of the times, not the desperation of the rich. Instead, what constitutes the "national interest" is whatever makes the rich richer and the poor poorer and threatens the future of society and its members. The media and authorities at every level do their utmost to encourage people to join in attacking the rights of their fellow human beings. Proclaiming an invasion, stationing troops and preparing to strip people of their citizenship are not developments the people of the U.S. support. 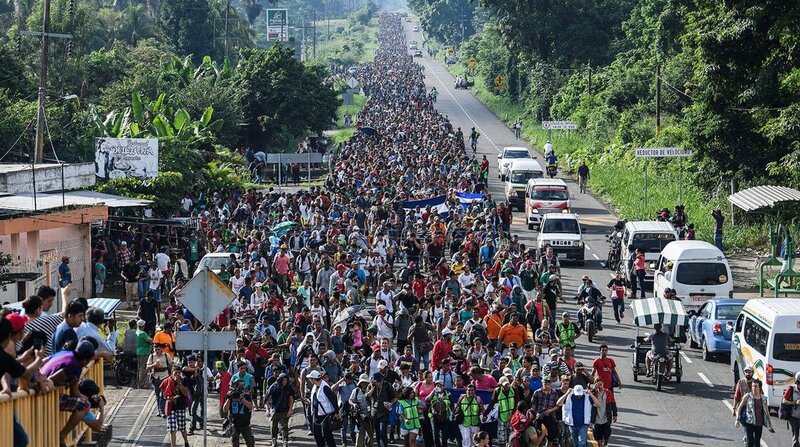 The thousands of migrants coming to the border, after travelling thousands of miles on foot -- at least one-third of them children, many more of them women and all unarmed -- are not an invasion force. In an interview with The New York Times, even Admiral James G. Stavridis, former commander of the U.S. military's Southern Command, openly called out Trump's "fictitious caravan invasion." Why then the language, the proclamation and troop deployment? Why also the threat to eliminate birthright citizenship, alongside the emphasis on "national interest?" These actions have far more to do with justifying use of force against the broad resistance to the U.S. attacks on rights taking place on both sides of the U.S.-Mexican border. They are directed at the people in the U.S. and the growing sentiment that this is not the kind of country people want. This was indicated by the broad actions against family separations bringing together people from all walks of life and various political views to say No! So too with resistance to plans for mass detention camps. Nurses in El Paso reflected the stand of many demanding Do Not Do This In Our Name, Do Not Do This in Our Community. 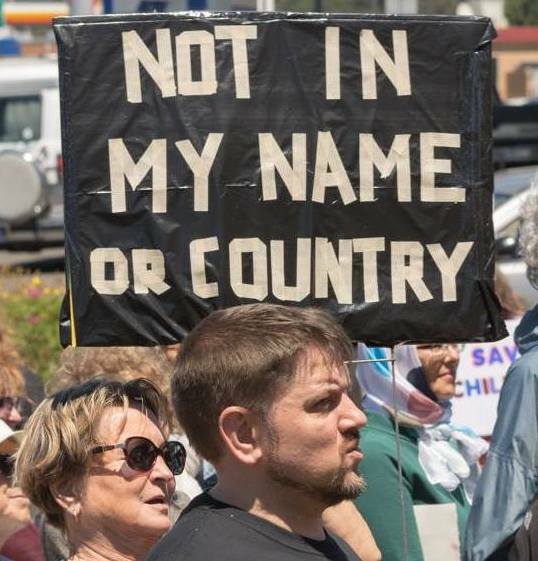 In California, when people heard of Pentagon plans for a detention camp for 47,000 people at Concord Naval Weapons Station, they refused, with signs saying No Crimes Against Humanity in Our Community Defend the Rights of All, Abroad and at Home! Consciousness is such that community refers not simply to the immediate community involved, but more broadly, to the community of the people of the U.S. It is a demand for that community to stand united and join in building the country they want. Caravan travelling through Honduras in October 2018 on its way north. President Trump has ordered at least 5,200 active-duty troops to the southern border with Mexico. These are in addition to the 2,092 National Guards already there. According to the Pentagon there are 2,800 active-duty troops in Texas, 1,500 in Arizona, and 1,300 in California with fewer numbers to be sent to New Mexico. The Pentagon said the number could reach 7,000 troops. Though troops will be working all along the border, most are stationed on bases near population centres like El Paso, Texas and San Diego, California. Already, port of entry areas and small border towns have large numbers of military vehicles, barbed-wire fences topped with razor wire and armed military patrols. The armed troops will engage in what the military calls "large-scale mass trainings on use of force." The military is providing the Customs and Border Protection (CBP) [the largest federal law enforcement agency of the U.S. Department of Homeland Security -- TML Ed. Note] with reconnaissance, intelligence, and helicopters with night-vision capabilities and sensors. They will also provide CBP agents with more military equipment like riot shields, tactical shin guards, three-foot extendable batons, and an assortment of "less-lethal " ammunition. The operation is under the command of General Terrence O'Shaughnessy, the head of Northern Command, which is responsible for the U.S., Canada and Mexico. It is significant that these are active-duty troops and not more National Guard. Use of the National Guard commonly requires the consent of the governor from the state involved. Active-duty military does not and is completely under the command of the Pentagon, including numbers, length of deployment and rules for use of force. Such a large deployment is hardly necessary for the few thousand women, children (at least one-third of the caravan) and men arriving unarmed, having travelled thousands of miles, mostly on foot, seeking asylum in the U.S. Rather, the military occupation and live military exercise inside the country is aimed largely at the peoples of the U.S. and Mexico, getting them used to and making it acceptable for the military to be present and active in large numbers. It also brings CBP, state, county and local law enforcement officials under military command. Such unified command is required in conditions where conflicts among these authorities contending with the federal government is increasing, especially in sanctuary states like California. It is also needed if the president uses what he has termed an "invasion," to justify not only troops but martial law. The military is not supposed to be used for policing and detention of any non-military person inside the U.S. This stems from the Civil War and Reconstruction era Posse Comitatus law (1878), which prohibits U.S. military forces from performing the tasks of civilian law enforcement, such as arrest, apprehension, interrogation, and detention unless explicitly authorized by Congress. The Pentagon insists the role of the troops is only in "support" and not enforcement. The peoples of Mexico, Colombia, Honduras, El Salvador and Guatemala, to name a few, are well familiar with the U.S. military acting in a "support " capacity. 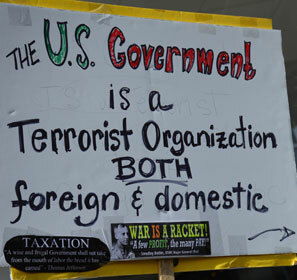 It means the U.S. military takes command, is commonly involved in detentions, interrogations and armed confrontations, with little regard for the laws and authority of the given country. It is likely this deployment will be no different, with military and CBP together acting with impunity against the peoples on both sides of the U.S.-Mexican border and with little regard for state and local authorities. 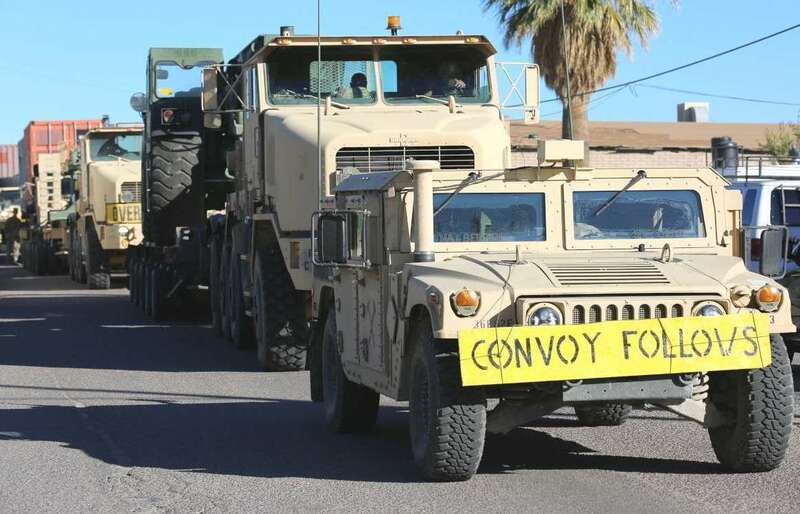 U.S. Army 87th Engineer Company deploys to the Mexican border. At the same time that Trump is deploying the military, he has also ordered the Pentagon to develop detention camps to hold 200,000 people to start -- again a number far larger than the unarmed refugees arriving at the border and seeking asylum. These concentration camps are planned for Fort Bliss and Goodfellow and Dyess Air Force bases in Texas and no doubt all the equipment being provided now, both by the military and CBP, will remain for such purposes. They are also planned for locations in California and Arizona, where troops are deployed, as well as Alabama and Arkansas. While, like the troops, Trump claims the camps are for immigrants and refugees, just the numbers alone indicate that the future plan is for anyone the executive deems a "threat to national security." If poor, unarmed families arriving mainly on foot can be called an "invasion " and a threat "to the national interest" as Trump proclaimed, certainly striking workers, anti-war protesters, water protectors and other environmental organizers, and others defending rights can be branded as such. Use of the military inside the country, concentration camps, barring asylum seekers, arbitrary detentions, and separating families are examples of the broadening use of police powers by the executive. The actions are openly illegal and taken with impunity. Plans to use executive orders to eliminate birthright citizenship would be one more example -- while clearly illegal, the executive can use police powers to implement it, just as is occurring with the illegal detentions and family separations. These actions carry on despite court rulings. The Office of the President is using police powers at home and abroad to further usurp and concentrate power in the hands of the executive so as to deprive the people of power and rights. It is this government of police powers that is the danger. The current use of the military, CBP, Immigration and Customs Enforcement (ICE) are evidence of this -- and all their actions have only increased the insecurity of the peoples, here and abroad. The solution lies in stepping up the fight for the rights of all, abroad and at home. 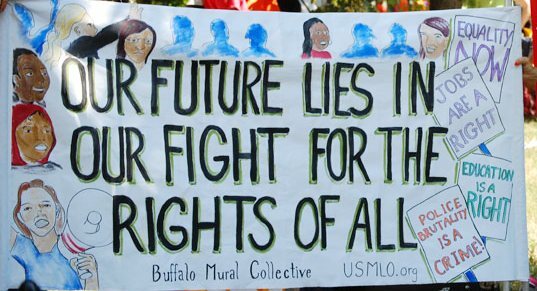 The organizing by military veterans to encourage current troops to refuse the orders to man concentration camps and attack refugees, the many immigrant and refugee rights organizations on both sides of the U.S.-Mexico border defending rights, and the anti-war organizing that stands as one with the peoples fighting for peace and justice, are contributing to a more secure world. Let all join in stepping up the fight for empowerment and rights! Remove All Troops from the Border NOW! Frederick Engels, the brilliant teacher and leader of the international proletariat, was born 198 years ago, on November 28, 1820. 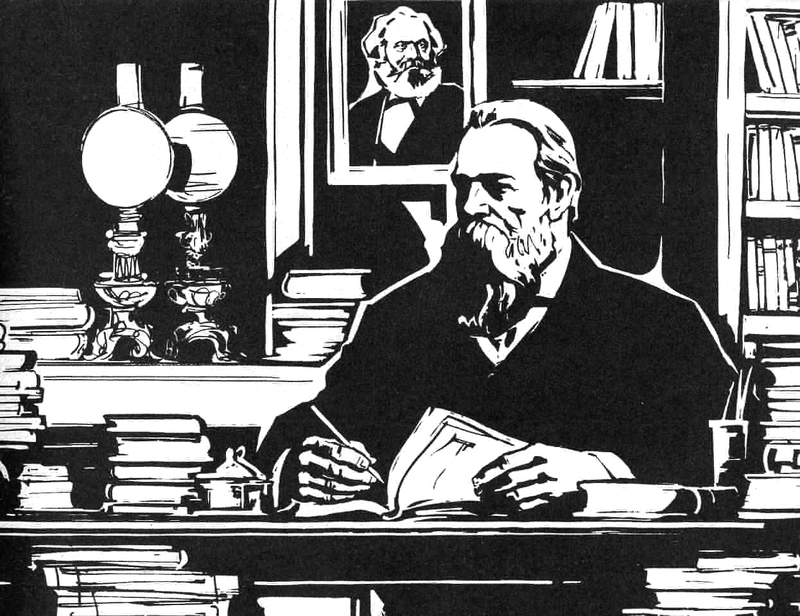 Together with Karl Marx, his closest friend and comrade, Engels founded scientific socialism, the indispensable theory of the struggle of the working class for its emancipation. His tremendous revolutionary activity spanned more than half a century during which time together with Marx he showed that the struggle for socialism is not a matter of a utopian dream, of some excellent "ideas" of which the rulers and governing classes only need to be convinced, but the inevitable consequence of the development of the productive forces of modern society and of the equally inevitable class struggle of the proletariat against the bourgeoisie which this development gives rise to. Frederick Engels was born in Barmen, in the Rhine province of the kingdom of Prussia. While still at school, he developed a profound hatred for autocracy and political despotism. Like Marx, he was a follower of the revolutionary teachings of Hegel, but, like Marx, he soon rejected Hegel's idealist views and used the dialectical approach in making a materialist analysis of the world. He used this outlook and approach when he carried out a comprehensive study of the conditions of the English working class after he settled in Manchester, in the heartland of British industry, in 1842 and saw firsthand the poverty and misery of the workers. The fruit of his studies and observations was a work of tremendous revolutionary and scientific value: The Conditions of the Working Class in England. In it, Engels was the first to point out the revolutionary side to the deplorable plight of the proletariat: that the conditions of the working class were irrevocably leading it to fight for its complete emancipation. The political movement of the working class would inevitably bring the workers to the conclusion that their interests demand the destruction of the very foundations of capitalist society, the rule of the tiny minority of exploiters and private property, and that there was no way forward except through socialism. Engels also showed on the basis of the dialectical materialist analysis of human society that socialism would only become a force when it became the aim of the political struggle of the working class. 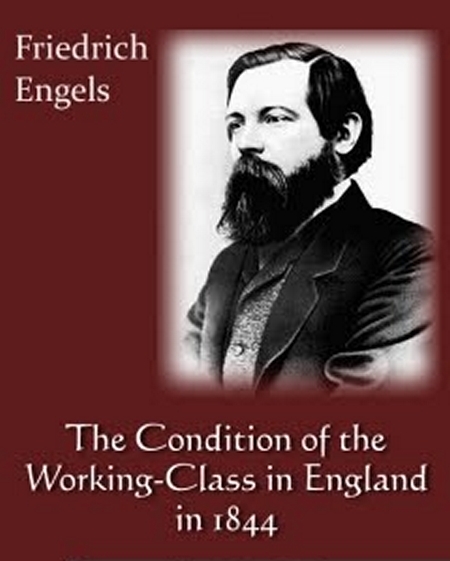 It was in England during this period that Engels became a socialist. 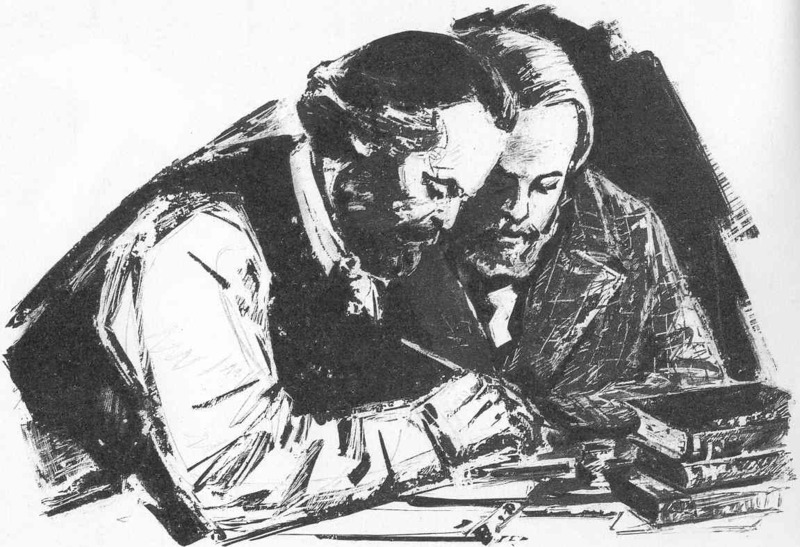 In 1844, Engels met Marx for the first time, with whom he had already begun to correspond, and they embarked in a life-long collaboration which was to provide the working class with the revolutionary science for its emancipation. That very year, they worked together to write The Holy Family, or a Criticism of Critical Criticism, in which the rudiments of revolutionary materialist socialism are enunciated. This work incisively criticizes the philosophy of the Bauer brothers and their "critical" approach to the situation in the world, and points out that the issue is not to contemplate the world but to struggle for a better order of society. 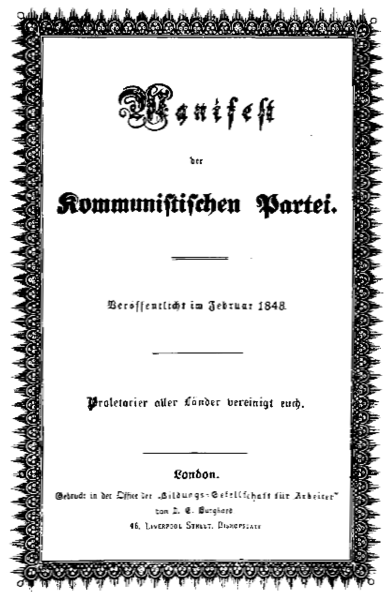 Cover of the first edition of the Communist Manifesto, in German. From 1845 to 1847, Engels continued his revolutionary work amongst German workers in Paris and Brussels where both he and Marx established contact with the secret German Communist League which commissioned them to enunciate the main principles of socialism as they had worked them out. In November 1847, having taken up this task, Engels completed the first draft of the Manifesto of the Communist Party. In this immortal work published in 1848, Marx and Engels brilliantly put forward the doctrine of scientific socialism, the program for the emancipation of the working class and the building of the new communist society. They placed the proletariat at the centre of social development and as the leader, inspirer, organizer and mobilizer in the irreconcilable class struggle against the bourgeoisie, its grave-digger. They pointed out: "its fall and the victory of the proletariat are equally inevitable," the working class must become the ruling class, it must use violence to counter the violence of the bourgeois state as it works to achieve the transformation of society and it must establish its dictatorship to emancipate itself and all humankind. Marx and Engels issued the clarion call, Workers of All Countries, Unite! This call embodies the principles of proletarian internationalism and shows the international character of the proletariat's struggle for liberation from capitalist exploitation and wage-slavery so as to overthrow the capitalist order and its state power on the world scale. The revolutions of 1848 in countries throughout Europe brought both Marx and Engels back to Germany. In Cologne, in Rhenish Prussia, they put out the democratic newspaper Neue Rheinische Zeitung and became the central figures in the revolutionary democratic struggle against the forces of reaction there. Reaction gained the upper hand, the paper was suppressed. After Marx was deported Engels continued to fight, actively participating in the armed popular uprising in which he fought in three battles. Finally he too was forced to leave the country following the defeat of the revolutionary forces. Shortly thereafter, he settled in England where Marx also settled, and their close revolutionary collaboration continued until Marx's death in 1883, yielding a wealth of revolutionary material which continues to be an indispensable guide to the revolutionary proletariat in its struggles to this day, having lost none of its validity and value. It was here that Marx was to write the greatest work ever done on political economy -- Capital. While Marx carried out his tremendous work on the analysis of the complex phenomena of capitalist economy, Engels took up the elaboration of science and outlook on a wide range of questions, often writing simple, concise works in a polemical style. Amongst his major contributions to the theory of scientific socialism during this period are the famous polemical work Anti-Dühring, in which he deals with fundamental questions of philosophy, natural science and social science, The Origin of the Family, Private Property and the State, The Housing Question and Ludwig Feuerbach and the End of Classical German Philosophy. It was Engels too, who carried out the major task of preparing and publishing the second and third volumes of Capital after Marx died leaving this work only in draft form. Engels' revolutionary work, however, went beyond this invaluable enunciation of the revolutionary theory of the proletariat. Like Marx, he too was active in the international working class movement, including his active participation in the International Working Men's Association founded by Marx in 1864. Even after the dissolution of the Internationale and the death of Marx, Engels continued to pay great attention to the development of the international working class movement. The correspondence which he conducted with communists and working class leaders throughout Europe and North America is amongst the treasures which he left the international proletariat, being rich in principles and in the enunciation of the revolutionary strategy and tactics of the proletariat. In all his work, the revolutionary essence of this brilliant fighter for the interests of the working class is always apparent. He never for a moment lost sight of the interests for which he was fighting, never lapsed into empty theorizing, but, on the contrary, repeatedly pointed out that "Marxism is not a dogma, but a guide to action." His writings to this day form an integral and essential part of the theory of scientific socialism -- an indispensable and invaluable guide in the struggle of the working class for its emancipation, for socialism and communism. Founding meeting of the International Working Men's Association in London in September 1864.